http://www.line-stickers.com/ – Go Naomi Watanabe! 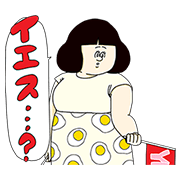 by Jigoku no Misawa Line Sticker | New animated stickers featuring Naomi Watanabe are here, illustrated by the one and only “Jigoku no Misawa”! Add these weirdly adorable stickers to all of your chats!